1. The Windsurfing Movie II is much, much better than The Windsurfing Movie. 2. It is not more of the first movie. It is different. Like the first film, “II” features absolutely spectacular footage of brilliant windsurfing in extraordinary conditions. Filmmakers Johnny DeCesare and Jace Panebianco have actually improved their skills at capturing the beauty and kinetic energy of windsurfing as practiced by the masters. But unlike the first film, “II” has some meaningful story lines that hold it all together more elegantly than the Interview/Rad footage/Interview/Rad footage motif of the first movie. Did I just say “motif”? Slap me. Maybe this is what I should say: I watched the first film twice, but haven’t taken out the DVD since. I’ve watched the new one twice, and I think I’m going to watch it again this weekend. And many times more. 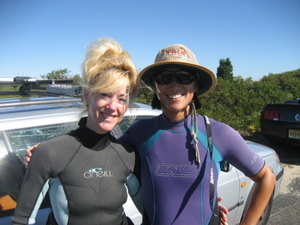 I’m still trying to wrap my head around some of the wavesailing! 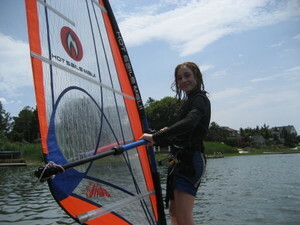 “The community of windsurfing is really tight, I feel like I've got friends all over the world because of windsurfing. But it all started in the Peconic Bay. It’s outstanding. Better even than you think it’s going to be. See genuinely wonderful windsurfing by featured riders Levi Siver, Kai Lenny, Mark Angulo, Robby Naish, Jason Polakow, Baptiste Gossein and others I forget. If you're not one of the ten or so people who read the Peconic Puffin in the '90's, this is one big "what the heck?" Well that's just how it's going to be! The creature above ("pre-smushed" says Cindy) is Theo. Theo is Jordan and Avery's new puppy, and adopted little brother of Spooky. Or at least he hopes to be. So far Spooky has expressed nothing but disdain for the new arrival ("You are dead to me" Spooky says, in a heavy doggy-Slavic accent) but Theo is persistent. 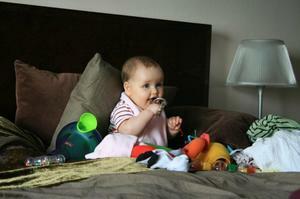 And very cute. 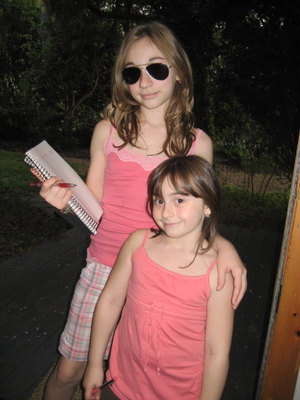 Slo has a nightmare once this beauty turns 16. And we have a new Puffin! Presenting the Peconic Puffin debut of Lea Slobadsky. 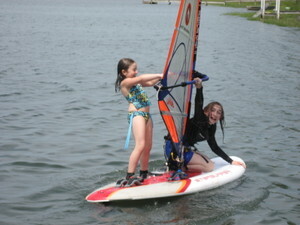 We'll have her on a windsurfing board by the time she's three. (Top Photo: There she is...Ms. Peconica. 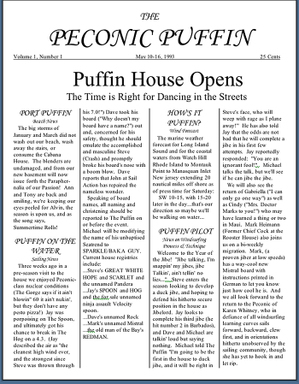 To amuse myself, as well as those first-generation Puffins who still poke around and anyone with too much time on their hands, I'm including the original Peconic Puffin (click on the images to read) from May of 1993. Pinky is a six-toed cat, and a local legend. Dave, Gabriella, Jay, Karen, Cindy, Steve, Mark and I shared the Puffin House. 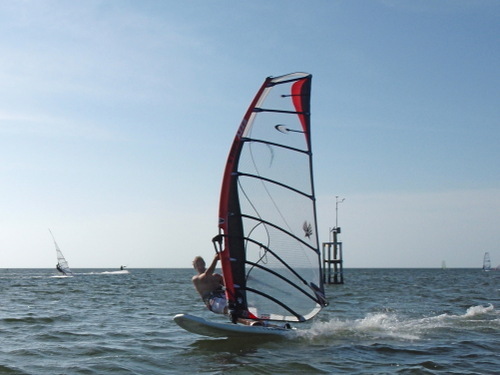 John at Sail Action is the nascent proprietor of Windsurfing Hamptons. Anyhow that was then. About fifteen people read the thing, and it was about those fifteen or so people. The blog is still about windsurfing and the people I sail with, along with whatever else comes to mind. Over a thousand people read it, almost all of whom I don't know. Every once in awhile someone walks up to me and says "Are you the puffin?" (It's almost always somebody recognizing my gear or the van. And it always shocks me.) 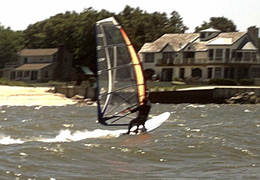 I've met lots of windsurfers on Long Island (most of whom are better sailors than I) through the thing. And I have friends I've never met from Malta, Australia and the UK to the Bay Area and Brooklyn (I got to meet OBX Bill a few weeks ago...that was cool, and totally not digital.) More windsurfing friends=good. Okay, time to go. Hopefully we'll get some wind on Saturday. "Bring all your equipment, and money to buy more." 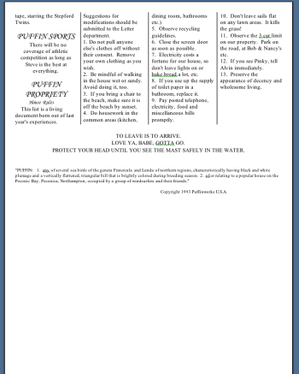 -traditional wisdom regarding conditions on the Outer Banks. Sunday, Monday, and Tuesday AM were decreed by the gods to be good for nonplaning freestyle. Steve ("I will get wet every day!") focused on clew first helis and working towards a gecko flaka, Jeff is refining his pushtack (and working on all things gecko) and Brewster is in the early stages of helitack wrestling, hitting several. Tuesday afternoon saw a return to 7.0. It's nice to plane, but we're all aware that back on our home waters, friends have been sailing 4 meter sails and tearing it up. 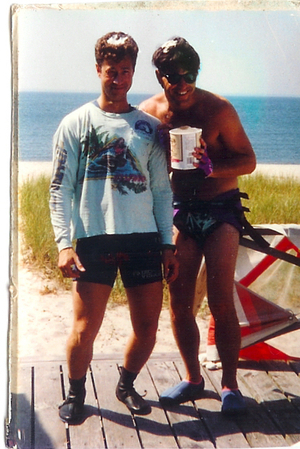 Brewster in particular is in agony (Steve and I understand that to come to Hatteras is to suffer...in the end you have a great time windsurfing but you EARN your wind, and Jeff is just laid back.) 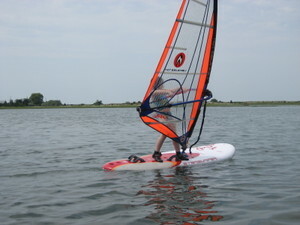 While I type this Brewster is reading posts in the Yahoo Long Island Windsurfers forum about the epic conditions. Small puffs of steam emit from his ears. Last night Jeff and Brewster went out for a bit of night sailing under the full moon. They came back with huge grins on their faces. But Brewster is still bugging out again this AM. It poured all night. This morning we had not one but two rainbows. Jeff says it's a good omen. And we have a small craft advisory for the rest of the week. Dana to Lily on the phone: It's foggy, but the fog might blow away. The day began with Sally and Michael visiting Lily and Wilson in Three Mile Harbor, and aside from a commitment to play hide and seek with Emma and Allie, all other plans were TBD. But we'd brought our gear, the forecast said Napeague might be planable from 4-6pm, and the other half of the Lilywilsondanaandy axis was already in position, so off to Napeague we went. Lilywilsondanaandyland is located directly across from the traditional Napeague launches...more or less due east from Lazy Point. We rigged in what will soon be the shadom of the new Chateau Lily and Wilson (house designed by Dana), which was having the finishing touches put on its foundation even as we carried our rigs down to the red sand beach. Sure enough, the wind kicked in just enough at 4pm, and we all planed off into the fog. Sally was working on jibing and waterstarting and straightline speed ("why do you go faster than me" she asked/accused her rigging-boy husband, who suspects that she'll be passing him soon enough.) Dana was working on...well, we don't know, because visibility was only about 100 yards, and she and the rest of the Napeague regulars just sped off into oblivion. Turns out that they knew the water was shallower in oblivion, whilst Sally and Michael found themselves waterstarting in overhead depths. With both speed and history in mind, Wilson noted the 50th anniversary of the Soviet Union's Sputnik space program, and declared that it was a good reason to pull out his drag board, an old F2 Sputnik, a board which in its day had the reputation of being the scary fastest board on the planet.. After a brief discussion ("Want to try sailing it? Yup!") Wilson put a fin on the thing, and Michael took it out for a spin. Pretty fast it went, though it was clear the board wanted more power. Hey Wilson...take that thing out with an overpowered race sail...just wear a flack jacket when you do! As the sun began to set our thoughts turned to the impending dinner party at Dana and Andy's. But while the grownups were discussing politics and duck jibes over a civilized glass of wine or G&T, Una and Emma were hatching a plot to hijack the event and move it to the domain of a giant jack-o-lantern that held court outside the house. "Tell the grownups to come outside" Emma declared. "Sit on that towel" instructed Una. And we did, and were soon rewarded with a sumptuous feast of clams, swordfish (grilled to absolute perfection by Andy) and a choice of pie. We also had some discussion about fog sailing...Dana noting her complete comfort jetting around on the bay she knows so well, but saying she'd be hesitant to so sail at Mecox. Michael said "Mecox is just fine in the fog, and for the same reasons (it's enclosed, no boat traffic, mostly shallow.) In any other conditions, though, windsurfing in fog can go very wrong, very fast. 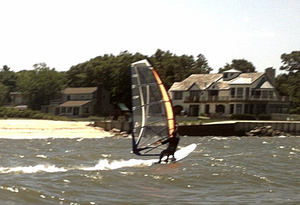 Saturday marked the triumphant return of Slo to board and boom, windsurfing on the mother waters of the Peconic Puffin (Little Peconic, Pink Palace launch) on his Screamer and a 5.8, accompanied by Michael on a 6.2 and 7.0. This is Slo's first windsurfing appearance in the Puffin since we went digital, though of course he figured heavily in the Sheepshead incident. Not only are Slo and his wife (the elusive Ivette) OG Puffins, but their son Eugene has been waving the flag lately in the form of some stylee new duds. 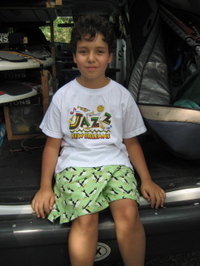 Look for Eugene to soon join the second generation of windsurfing Puffins. Our house is on a creek...technically a tidal inlet, but creek by name. It's about 50 yards across in the wide spots. When we bought the place I thought perhaps I might do a little longboarding and nonplaning freestyle on it, and over the years this has proved to be lots of fun when the wind is light and northerly. Everyone from our neighbor Remy to our former (and aspiring return) neighbors Melissa and Sam have tacked and jibed and pointed and reached with us on the little patch of water in the back. While the Freestyle Frenzy was going on up in Cape Cod, this past weekend also saw a major Peconic Puffin extravaganza, as Steve (a founding Puffin) brought Jordan and Avery (Puffins since birth) into the creek for some windsurfing 101, while Sally and Michael sailed alongside. Avery shocked everyone by immediately assuming perfect form and sailing off towards the horizon (which on the creek means she ran aground after 20 seconds) and Jordan pulled off a tack within her first two minutes of windsurfing. Steve was advised to immediately pack his children off to Bonaire so that they might come back in a year throwing clew-first Chacho Libres and such moves. But it was more than just these hot-shot half pints ("Say 'I'm an evil child with cool moves'" said Avery, who likes to micromanage her own press) as Sally was working on pivot jibes, Steve was experimenting with the Jack (backwind pivot jibe-duck to clew-first) and Michael was trying to hit his Radar Tack routine (subject of a future post.) Still, the young guns were the stars...check out all the action in this Peconic Puffin photo spectacular! "What's so funny?" asked Steve. "Me. I'm worrying about a bit of mustard, as if I'm not going to be falling into the water repeatedly in less than a minute. You could put a scoop of ice cream on my head and there would be no trace of it five minutes after I begin windsurfing." The thought appealed to Steve. He proposed that we in fact put a scoop of ice cream on my head. And as a gesture of puffinly brotherhood, he would also don some cream, even though he was a much better sailor who might not fall until his vision went vanilla. The Horse's Mouth has a regular Friday feature called Fish on Fridays, which is on the Peconic Puffin's required reading list. We like a good fish. But last Friday's FOF really caught our eye. Take a good look at the fish in the picture. Look familiar? For a number of Puffins and friends of Puffins, the answer may be Yes. It's a Sheepshead...Archosargus probatocephalus. A sheepshead figured heavily in a Puffin escapade a few years back...Slo and Jay caught it...Michael admired the character and countenance of the fish so much that he suggested we take it to a bar and buy the fish drinks (Radar Tom offered to get the first round,) but when it was all said and done Slo carved it into sashimi, which we washed down with a Viognier...at 10 o'clock in the morning. We were in Cape Hatteras, which should be taken into account. Were You On The Guest List? 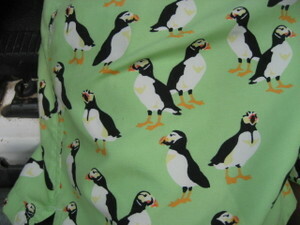 A Puffin Party Exclusive! The glitterati joined the winderati Sunday night at an exclusive bash at Sally and Michael's place. Advance word of the event was strictly hush-hush, and admissions at the door were kept strictly A-list Puffin celebrities. Update from the edit room, where producer (and OG Puffin) Jace Panebianco and producer/director John DeCesare are combining presumably awesome footage with an equally awesome soundtrack (we hear it's all awesome, and we believe it.) A release date has been set: July 1st, in Hood River, at a special event hosted by Robby Naish. The DVD will begin shipping at this time as well. The movie website is offering free t-shirts and signed posters for early orders. Check the site for details. I have been following this thing since its inception (I've known Jace, as many Long Island sailors have, since he was a skinny teenager working at the windsurfing shop) and I must say it sounds like it's going to be quite great. For myself, the idea of Robby Naish alone shot windsurfing for the big screen is...something I want to see.